Go to any potluck or dinner on the grounds and you will likely see this sweet salad—this “food of the gods”. Other than the fact that it is incredibly sweet and we can actually call it a salad, I think Real Southern Men like Ambrosia because it is endlessly customizable. Some folks add nuts. Some add other varieties of fruit. Some add extra sugar. Some use only Fruit Cocktail. Some (obviously under some sort of Yankee influence) add pretzels. Real Southern Men love to customize. Look at our trucks, our yards and even our house trailers—we like to add to, soup up, jack up, reconfigure and generally make what we have our own—even our salads! The odd thing about this very southern of dishes is that sometimes you will see it placed with the desserts and sometimes with the salads—resulting in somewhat of a mistaken identity. Is it a salad or is it a dessert? It has fruit, so it may be a salad. But many recipes call for sour cream, whipped cream, powdered sugar, coconut shavings and marshmallows—that sounds a lot like a dessert to our crack staff. 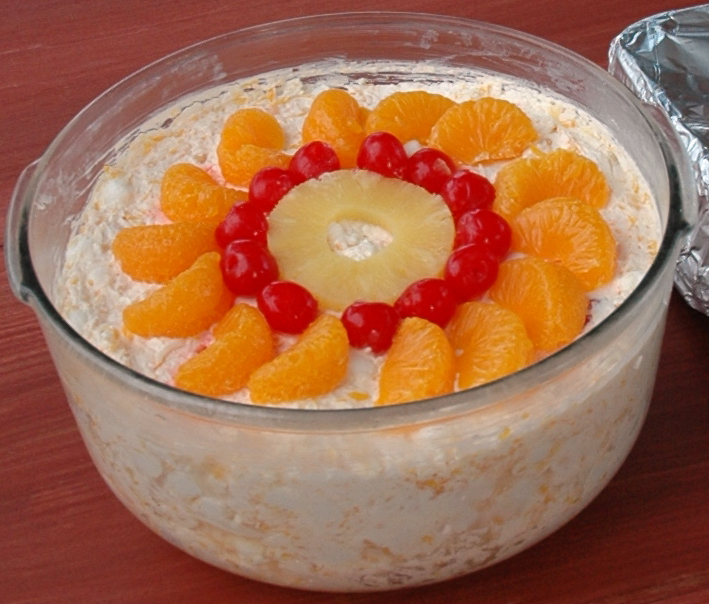 Maybe we can simply coin a new phrase like “Dessert Salad” to describe this southern delicacy. Call it salad, but just feel a little bit guilty if we eat it before our meal. For us, it is a very southern sweet. No matter what we call it or where it gets placed on the potluck table or if you eat it before your meal or after, it is still a sweet treat enjoyed by many a Southerner. Next time you are down at the church for a potluck, make a note of where the Ambrosia Salad is placed on the serving table. We at real Southern Men would like to hear the results. You can find me over at the house, we’ll be the ones putting the mud tires on the Toyota Mini van. To vote for Ambrosia Salad in the Southern Sweets Showdown, go to our Facebook page. This post was written by jerrodwbrown who has written 11 posts on Real Southern Men. I listen. I dialogue. I converse. I read. I study. I teach. I share my thoughts. I write. I communicate to others those matters, ideas and thoughts that are worthy of note. I’m a father and a husband. I’m a thinker, a reader and a writer. I’m a triathlete, a runner and a cyclist. I’m a thrift store junkie. I am a beard and vinyl record aficionado. I am unapologetically Christian.